I threw a little Halloween Party yesterday. We have been in and out of town the past few weeks and our weekends have been slammed with activities... so I didn't really start planning what we were going to do at the Halloween Party until Sunday night (the night before the party)... which is really last minute for me. 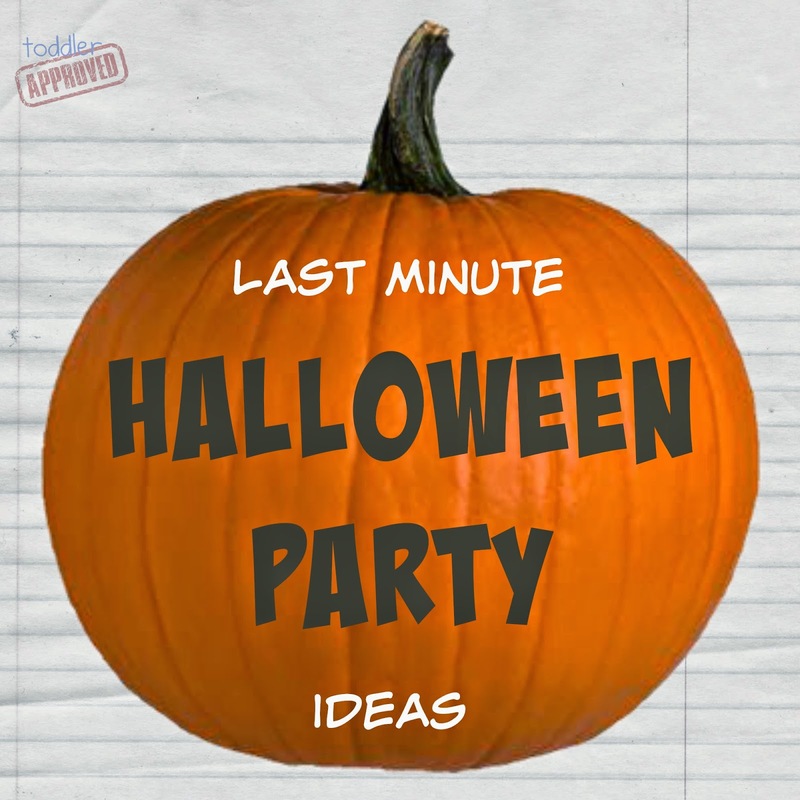 Here is a list of super quick and easy crafts and activities that are perfect if you are trying to put together a last minute Halloween party. These were awesome for me! I also included some of my favorite party foods that are pretty simple. I'd love to hear some of your ideas too! 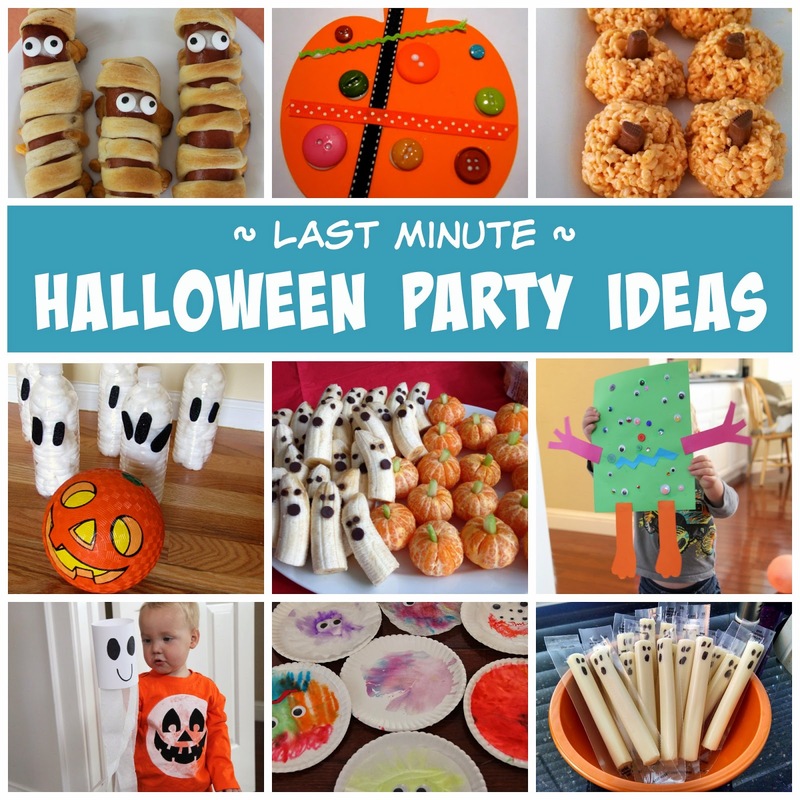 We didn't do all of these crafts and activities at my party, since you really only need a few, but I'm putting all of these in one spot anyway... for next time. You can find my complete tutorial for this Easy Monster Craft activity here on my blog. It is pretty basic. My favorite sort of activities for toddlers involve collages. I shared this activity in our Halloween newsletter last week. You can use paper cylinders, paper plates, or even a white paper cup to make these. Then just hang white streamers from them and add a handle to hold on to. We used a craft stick. My son loves running around the house with his! For this activity I gave the kids white glue, pumpkins, sequins, foam shapes, and googly eyes. The activity was very open-ended and they had a blast! I love this bowling game by No Time for Flahcards! I had this game ready to play but we didn't end up playing. You can find the tutorial for these Colorful Paper Plate Monster crafts here on my blog. These are great since they all turn out so differently and kids love getting to use spray bottles. It doesn't get easier than this craft. 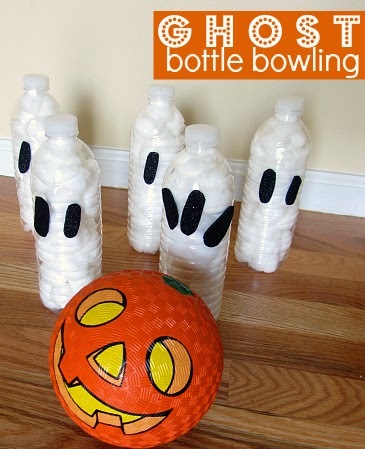 Just buy the foam pumpkins or cut some out yourself, lay out supplies and glue, and let kids create! Instead of using foam pumpkins you could do these with REAL pumpkins instead. Both are fun! 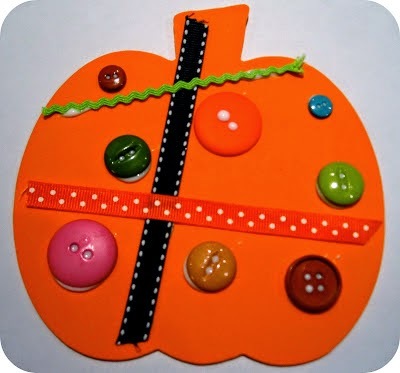 Full instructions for the Button Ribbon Pumpkin craft are here. This activity is SO EASY. Just download the Monster Mash music and have kids the kids dance around. When the music stops they have to freeze in their best monster pose. Keep playing till the kids are all tired out! 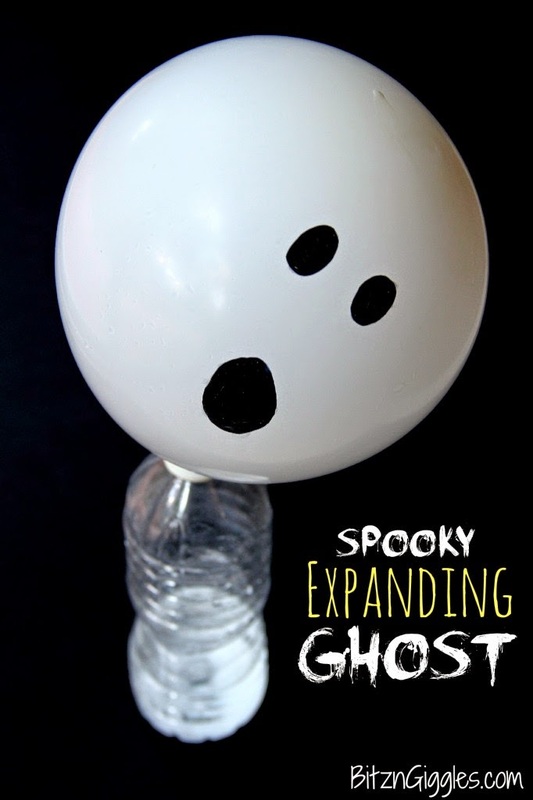 I wish we'd had time at my party to do this ghost science activity from Bitz N Giggles. I'm still going to do it with my own kids this week. I usually let the older kids try and do it themselves and the younger kids just watch. Cut out some ghosts from white cardstock and hide them around your house. Have the kids go and find them! Here's a ghost template I've used. You can put numbers on each ghost so that you make sure you find them all. All you need is some sort of picture and a bunch of marshmallows for this one. Go to our Silly Marshmallow Designs post for more instructions and ideas. 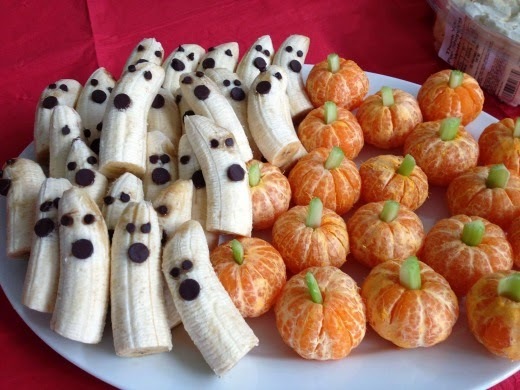 Here are some easy peasy snacks and treats that I like to make for Halloween parties or lunches! 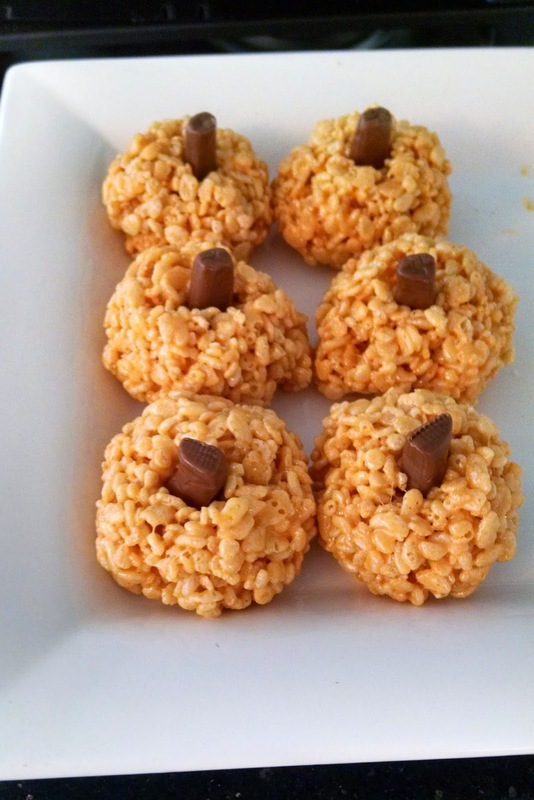 I got this pumpkin crispy treat idea from Home Stories A to Z and just used regular rice crispies for ours. I have seen these all over pinterest in a variety of places. I am still trying to track down the original blog I found them from and when I do I'll share the link. 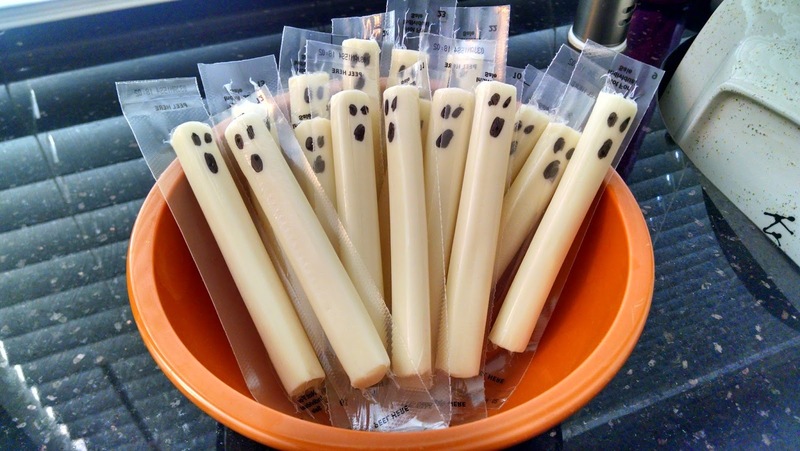 Sharpie ghost faces on cheese and you are done! These were a hit! 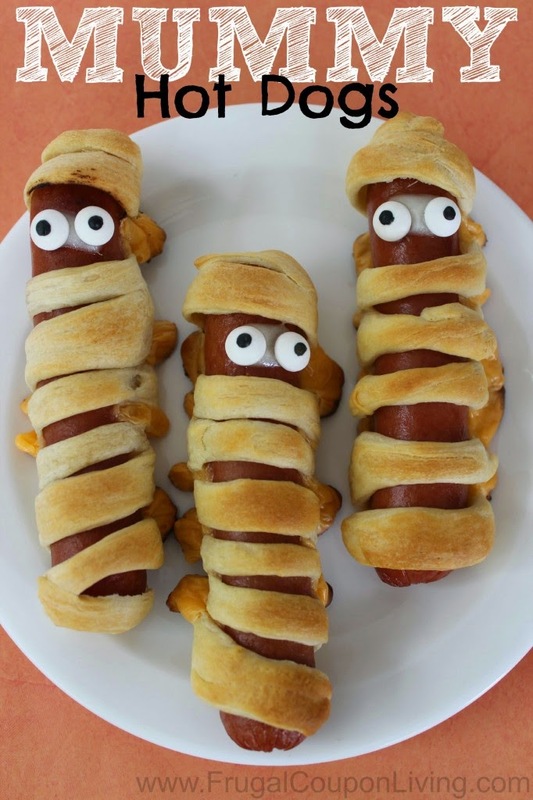 These mummy hot dogs from Frugal Coupon Living are always a favorite when we have a Halloween party. 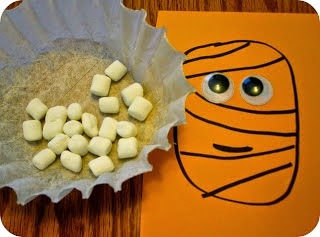 Mine didn't really look like mummies, but the kids loved them anyway. These weren't actually easy... but since my husband made them for me, I'm adding them to my list of favorites. 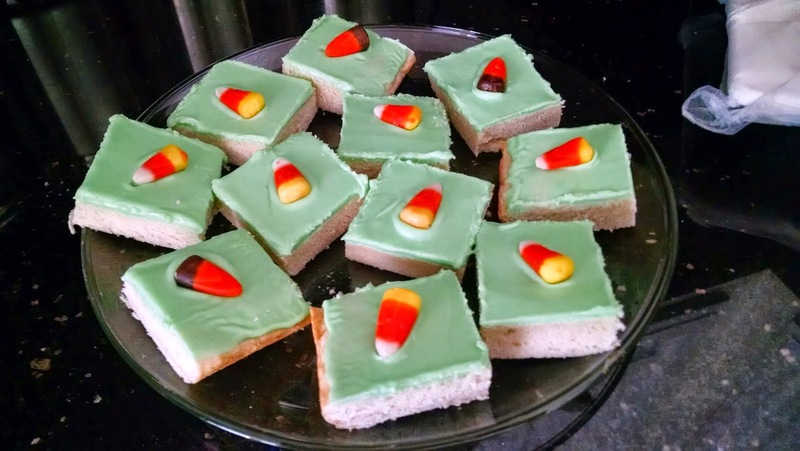 We used this sugar cookie bar recipe from Make Ahead Meals for Busy Moms. It is yummy! They usually taste better the second day once they've had time to set, so these are good to make the night before if you are able. We added candy corn on top to make them festive. These just require some frosting, candy googly eyes, and the cupcakes. These simple snacks from Princess Pinky Girl are GENIUS, healthy, and so easy! See any ideas on here that you want to try? 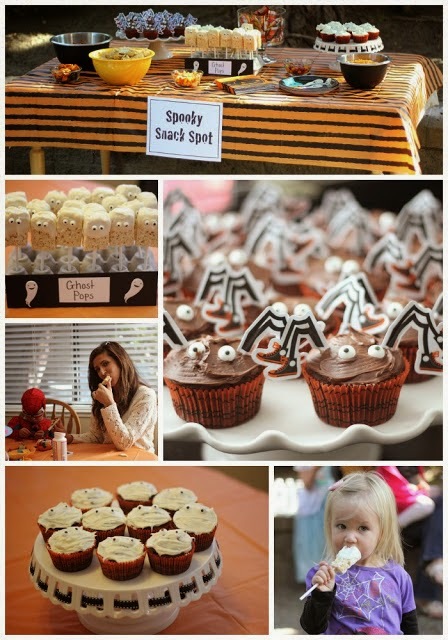 Are you throwing a Halloween Party? Do you plan ahead or do everything last minute like me? PS- Did you know I launched my new book Fizz, Pop, Bang! two days ago? It is filled with science and math activities. You can check out a sneak peak here... and grab a copy of the book here. Yay! Love this! 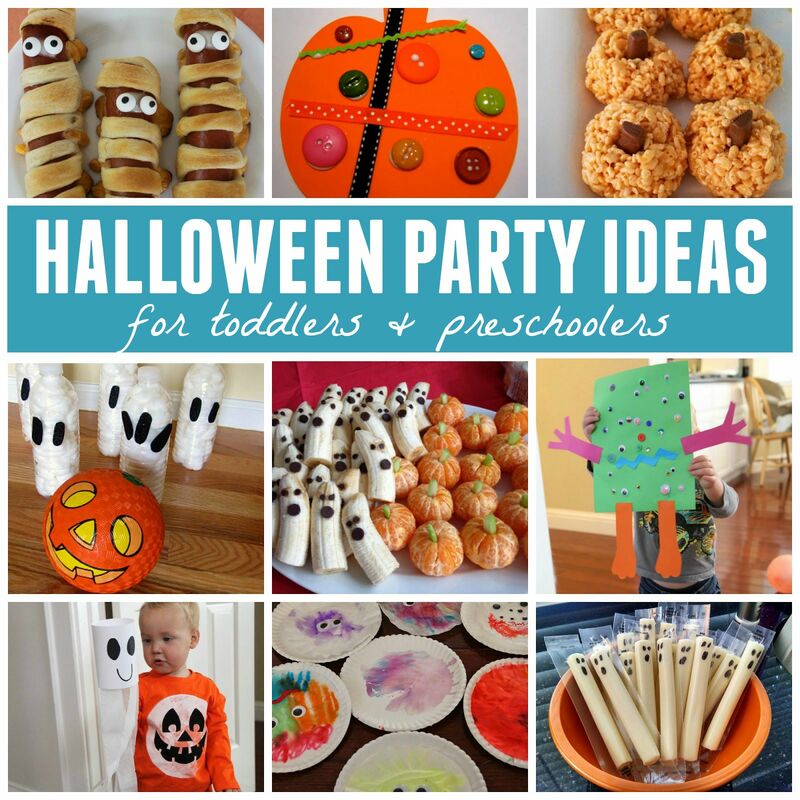 Can you post some November bday party ideas? Nice. You have some really creative ideas.